In October, the Fellows received an arrangement of Tchaikovsky’s Romeo and Juliet Overture and Prokofiev’s Romeo and Juliet Suites by Civic Orchestra Principal Conductor Cliff Colnot. In addition to tackling two challenging orchestral scores that had been condensed down to eleven instruments, we were tasked with creating an educational program exploring Tchaikovsky’s and Prokofiev’s musical interpretations of Shakespeare’s Romeo and Juliet to take into the Chicago Public Schools in January. In December, we were lucky enough to meet with teachers from the five schools we’d be visiting the following month. Our goal was to prepare the 6th-8th grade students for their visit to Symphony Center to hear the CSO perform Romeo and Juliet in February. Each school will be presenting a capstone project in May after having spent the semester exploring Shakespeare’s work. These projects ranged from stop-motion films to paintings and musical compositions. However, every school mentioned they hoped to compare the different choices made by the composers when reacting to the story, which inspired us to dive into the music to and create an engaging program to give the students a meaningful experience with Tchaikovsky, Prokofiev, and Shakespeare. Flash forward a month and we were visiting each school during the coldest week of 2016 (so far)! Aside from bitter early morning train rides, we had a great time connecting with the students. Guided by our meetings with the teachers in December, we chose to focus our program on the choices and consequences in Romeo and Juliet. The fellows examined the ways in which Tchaikovsky and Prokofiev chose to represent the story in their music, and what consequence that has on us as listeners. We chose to use the infamous story as an entry point into the beautiful sound worlds of Tchaikovsky and Prokofiev. Melanie showed the students how the relationship between the Montagues and Capulets is represented in the music through dark, loud, and accented brass melodies. Davis discussed with the kids how Tchaikovsky describes love with his famous love melody, while Prokofiev literally paints a picture of the balcony scene in his ballet. Sam demonstrated how Prokofiev illustrates sword fighting in “The Death of Tybalt” using col legno, a technique where string players hit the wood of their bows against the strings. Lindsay concluded the presentation by discussing how Romeo’s choice to kill Tybalt, illustrated by 15 hits in the low strings and percussion, ultimately leads to the deaths of the two star-crossed lovers. We enjoyed last week immensely, and had a good time connecting students to music through a timeless centerpiece of culture, Romeo and Juliet. 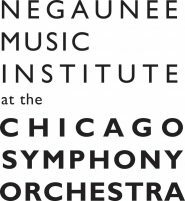 In addition to representing the CSO Connect program in the schools last week, we are excited to begin 2016’s Chicago Youth In Music Festival this week, a month-long celebration of young people in music. We serve to mentor and inspire the students we’ll be working with over the next several weeks in different schools. The final event is an open rehearsal of Tchaikovsky’s Romeo and Juliet Overture on Monday, February 15 at 7:30 pm.